I taught myself how to knit when I was ten years old, sitting in my bedroom, following a Vogue knitting pattern and emerging triumphantly with a white bed jacket, of all things. It had a seed stitch border on it and ever since that first project, it’s been my favorite go-to pattern for most of my knitting projects including this one. Knitting serves to while away time that one might be spending idly by and also as an outlet for one’s ideas. 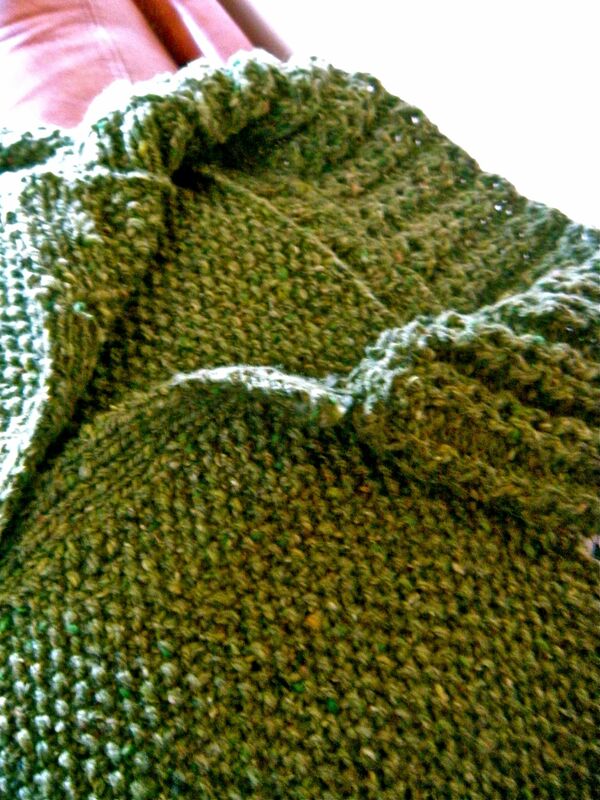 I challenge myself by knitting from scratch – that is, without a pattern which usually entails numerous do-overs until the sweater is finished to my satisfaction. And truth be told, I almost gave up on this one and put it away without sewing it up! But, listening to “Bluebloods” seasons 3 & 4 on my laptop to keep me company, I decided to take it on, revamping the sleeves so that they morphed into a dropped shoulder dolman sleeve that was just the right length to the wrist after retrofitting the armhole opening once the fronts and back were sewn together. See what I mean? It always amazes me how much time and steps are still required even though you think you’re done after the main pieces are knitted (fronts, back and sleeves.) For example, this neckline was finished with knitted ribbing first, then attached to the cabled ribbed collar (that started out as a bottom cuff) so that it would stand up properly. 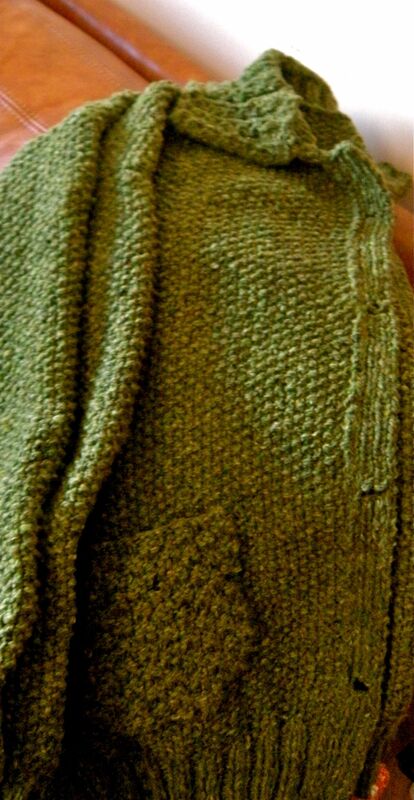 The pockets were knitted in a moss stitch (double seed stitch) to contrast with the allover seed stitch pattern of the sweater. The front ribbing for buttons and buttonholes were knitted during this phase also and sewn edge to edge with the fronts so that they would lie flat. I’m waiting for the buttons to arrive (olive green tortoise shell with a raised edge) and will sew them on next week. Knitting is sometimes carried out as a waiting game. I wouldn’t say that I was fatalistic while knitting this sweater, but I had a hunch it would provide many challenges before it was completed. But it was the beauty of the yarn itself, a soft wool, silk and cashmere blend in a moss green tweed color that kept me going. I used to have a brown cable knit sweater that I wore while the girls were growing up and we lived in Lexington. Long gone, I’ve tried to replicate it a few times either by finding one used or knitting another one. But today, I have decided that this will represent that sweater to me during this next phase of my life. Good to change colors and to wear something a little different, just as it will be to refresh my outlook with a sweater knitted from this beautiful yarn called “Wintergrass”.